A magnitude-5.2 earthquake struck southern Illinois early this morning, at 4:37 a.m. local time. At 4:37 a.m. local time, a magnitude-5.2 earthquake rumbled across southern Illinois, producing a rude awakening for people across the Midwest. The focus of the temblor was about 11.6 kilometers deep, according to the U.S. Geological Survey (USGS). The earthquake’s epicenter, seven kilometers north-northeast of Bellmont, Ill., is in the Ozark Dome region of the Illinois Basin, which covers parts of Indiana, Kentucky, Missouri and Arkansas. Earthquakes have occurred periodically in the region, with the most powerful a magnitude-5.4 earthquake in southern Illinois in 1968, according to USGS. The Ozark Dome region is far from any tectonic plate boundaries, where the causes of earthquakes are better understood. The region contains many known faults, but many others remain undetected. Scientists are also uncertain about which of the known faults are still active. Although less frequent than earthquakes in the western United States, earthquakes in the east-central United States tend to be felt over a much broader region, according to USGS. Earth’s crust is older in the Midwest than in California, and therefore is also thicker, cooler and more brittle, so earthquake shockwaves also travel farther and faster in the Midwest. The USGS Web site received more than 23,000 reports from people who felt shaking from the earthquake, from as far away as Georgia, West Virginia and Alabama. Minor damage to buildings in Louisville, Ky., from Friday’s earthquake was reported by the city’s CNN affiliate station, according to CNN.com, but no major damage has yet been reported. 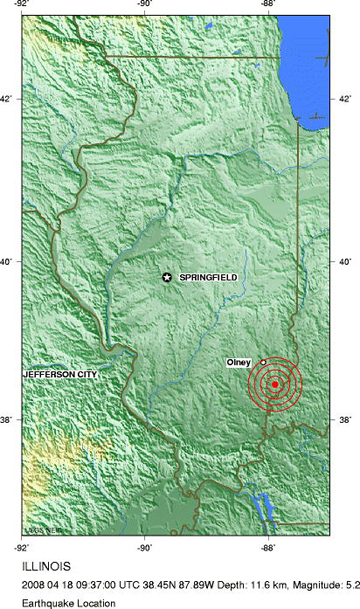 The Ozark Dome region is northwest of the more seismically active New Madrid zone, where a series of powerful earthquakes stronger than magnitude 8 in 1811 and 1812 caused widespread damage throughout the Missouri Territory, rang churchbells in Boston, Mass., and altered the course of the Mississippi River.